How do I do more with the Active Learning tools? The UNSW Lecture Recordings+ service supports a variety of tools that lecturers and students can use before, during and after a lecture. These tools can be used to improve student engagement and the learning experience in face-to-face, blended and online classes. Interactive Slides are various activities that students can complete during the lecture. By adding these slides, you can measure students' understanding or conduct quick polls, while also increasing student engagement during lectures. Multiple Choice By viewing a question and a list of possible answer choices, students can pick the answer they think is correct. You need to specify the correct answer before you save. Polling is setup very similar to Multiple Choice question, simply do not specify the correct answer. Short Answer After viewing a question, or statement and instructions, students enter their responses into a text box. Image Quiz After viewing an image and the associated question, students must click on an area of the image they think is the correct answer. Ordered List Students respond to your question by arranging a list of possible answers in the correct order. Numerical Quiz After viewing the question, students can enter a numerical value or a range of values they think is the correct answer. Access the Echo360 course section through the link on your Moodle course home page. Click the presentation icon for the lecture you want to edit and click Edit Presentation. At the top right, click Add Activity and select which activity you want to add. Add the question, answers and upload images where appropriate. Once complete, click Done. For some question types you can specify the correct answer and/or require students to give a justification for their answer. These can become discussion triggers once you reveal the results when the activity is completed. For more information about the action buttons below questions visit Showing interactive slide results in class. You can reveal the overall class results and the justification comments on an activity slide, but to see detailed individual student responses and analyse them you would go to the Analytics Tab. Find out more at Reviewing All Student Responses to Activities. During the lecture, students can raise any questions regarding the course content using the Discussion panel. These questions can be viewed and answered by the lecturer and also other students, encouraging them to engage in a discussion with their peers. As there may be too many questions, students can endorse the questions they want answered by using the "thumbs up" icon, to give you an idea which ones should be responded to during the lecture. When used effectively, the Discussion panel allows students to improve their and their peers' knowledge without disrupting the class. While students can post questions anonymously, keep in mind that it is not completely anonymous as instructors can view who posted the question and moderate them if necessary. If you click on a question or comment in the Discussion panel the student who posted it will be revealed. You should disclose this to your students so that they are aware that they are not anonymous to you. To access the Discussions panel during a lecture, navigate to your course in Echo360 and click on the current lecture. At the top of the page, click the Discussions panel icon . The panel will appear on the right side of the screen, showing the questions that were posted in the current class. You can create a new question or comment by clicking New Question, giving you the option to reference a specific slide or part of a recording. You can also access the Discussions panel by clicking Q&A at the top of your Echo360 course section page. During any part of the lecture, students can click on the Confused flag to mark any slides they don't understand. This gives you immediate feedback, letting you know which concepts they are struggling with. It is also useful when revisiting the slides after the lecture, letting you adjust the course content based on what students need help with. You can obtain detailed information on the Confusion flag with the Analytics tool, giving you a breakdown of the number of flags that were raised for each specific slide. 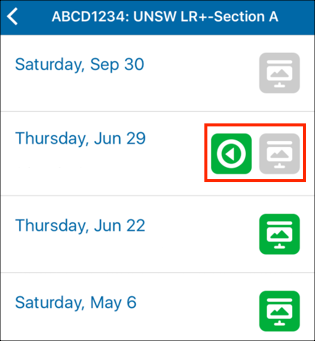 When viewing the lecture slides, you will be notified when the confused flag is raised as the icon is highlighted at the top of the page. While this feature is available during lectures, keep in mind that there is a delay in your notifications when students raise the flag. You may miss these flags when going through the slides quickly or have the presentation window enlarged to full screen, however flags remain and can be viewed after the lecture using the Analytics tool. Remind your students to post a comment or question in the Discussion panel to explain exactly why they have raised a confused flag. The Analytics tool gives you an overview of various statistics such as lecture attendance rates and activity participation that are collected as the trimester progresses. Along with a trendline, these statistics can help when adjusting your upcoming lectures, such as by revisiting slides that students marked as confusing. To view the Analytics tool, access the Echo360 course section through the link on your Moodle course home page. Click Analytics on the top right of the page and select which data you want to view. A bar graph will appear to give you a better understanding on the data throughout the trimester. You can also view individual student data to by clicking on Students on the left side of the page. While students can take notes using their own applications, the Notes tool will provide advanced features such as matching notes to the corresponding slides and recording timeline as well as being accessible from multiple devices. Along with the Search and Download function, this can be particularly useful when students review notes for an exam as their notes are much more detailed and organized. Aside from storing your lecture slides and recordings, the Library also lets you edit the presentation slides by adding interactive, media or blank slides. After uploading your slides, they should automatically appear in the Library which is accessible at the top of the page. Hover over the slides you want to edit, click the drop-down menu and select Edit Presentation. Choose which types of slides you want to add by clicking Add Activity or Add Slides at the top-right of the page. If your course has not opted for auto-publish, the Library is where you can view the recordings and lecture slides and make them available to students. Navigate to your Library and find the content you want to publish. Click the Publish button at the bottom of the page and select the course you want to publish to, and the date and time to make them available or unavailable. You also have the option to share the content to others by selecting To an individual and typing their email address. Keep in mind that you can only share content that you have created or uploaded, available under My Content. UNSW Lecture Recordings+ will receive an update on the 23rd of January 2019, primarily to improve the library functionality. More information can be found here. Auto Transcript feature is turned ON by default with all lecture recordings. 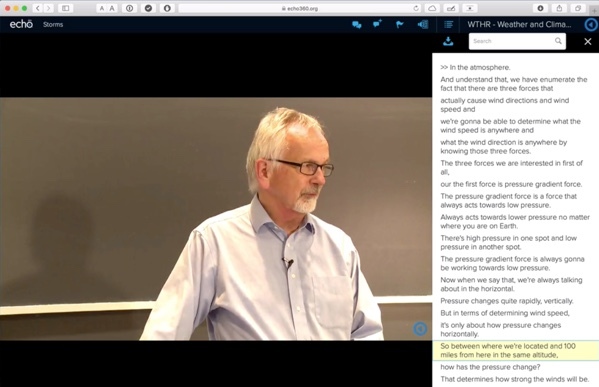 This feature provides a live transcription of Lectures. The Auto Transcript feature displays a text transcription using the Automatic Speech Recognition (ASR) technology. This feature enables a better delivery of the course content and aids in mitigating communication errors in the lecture recordings. This feature is being piloted at UNSW in November and December 2019. The accuracy of automated transcriptions is often approximately 90% but can be less if the quality of the audio recording is poor. To improve the automated transcription you can download and edit the system generated auto transcript file, manually edit the file using a suitable text editor and then upload the file to the captions section of the recording. The Atom editor is a commonly used free editing tool. You can download the free version of Atom here. An online editor will be available in Lecture Recordings+ interface in early-mid 2019. The auto transcript feature is enabled by default, but instructors can choose to disable it in their section settings>Features>ASR. For more information, please visit the edit captions page. The mobile app is an application available for your phone or tablet, designed to be a simpler version of the Lecture Recordings service that you can access at any time. While you can also use your phone's browser, the app is better suited for handheld devices and will be easier to use than the browser. For information on the current functionality, visit What the Mobile Apps Can and Cannot Do. You can download the latest Echo360 application from either the Apple Store, Google Play or Windows Store. Once installed, the app will request you enter your school assigned email address. Please enter your primary UNSW email address within this field. Once confirmed, the app will redirect you to UNSW's authentication page where you can then sign in. To view a lecture recording/slide, select the course they are located in and click on the video or presentation buttons. Compared to a computer, the mobile app lets you access your lecture material using a handheld device. This can be useful during a lecture as it allows you to move around the room and engage with your students while controlling the study tools such as Interactive activities. When doing this, keep in mind that your mobile app is not connected to the projector and can only change lecture slides through the computer. Also, note that the microphone will not capture your voice if you do not take it with you as you walk around. For information on how to access the learning tools, visit Navigating the Echo360 Mobile App. To upload your presentation to a class, in powerpoint or PDF format, please follow these steps. 1. In the class list, for the upcoming class, Click the button. 2. Click Upload a file from the options. 3. 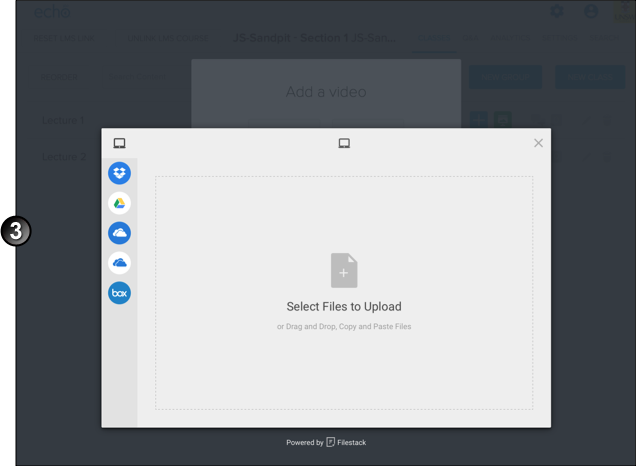 Upload the desired presentation from your computer or any other cloud service that you use. 4. Enter the lecture theatre, access your UNSW Lecture Recordings+ link within your Moodle course on the venue computer, and open the appropriate class.